This story was updated at 5 p.m. ET. The sun unleashed a huge flare Thursday (July 12), the second major solar storm to erupt from our star in less than a week. The solar flare peaked at 12:52 p.m. EDT (1652 GMT) as an X-class sun storm, the most powerful type of flare the suncan have. "It erupted from Active Region 1520, which rotated into view on July 6," NASA officials said in an alert. Active Region 1520, or AR1520, is a giant sunspot currently facing Earth. According to NASA and the Space Weather Prediction Center (SPWC), which is operated by the U.S. National Oceanic and Atmospheric Administration, today's sun storm registered as an X1.4-class solar flare. It is more powerful than the X1.1 flare that erupted on July 6 from another giant sunspot known as AR1515, making this latest tempest the strongest solar storm of the summer so far. "It's quite extensive," Young said, adding that sunspots the size of AR1520 are normal as the sun nears its peak of its weather cycle in 2013. 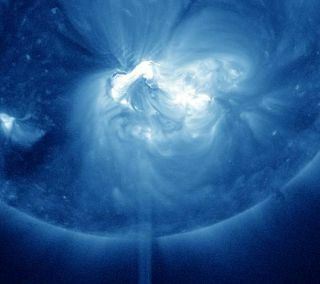 But while sunspot AR1520 may sound like a solar behemoth, it is actually a relatively modest sunspot example, and promises more sun storms to come, Dean Pesnell, project scientist for NASA's Solar Dynamics Observatory, told SPACE.com. "It's certainly not done. It's only halfway across the face of the sun right now," Pesnell said from the Goddard center in Greenbelt, Md., which oversees the sun-watching SDO mission. "We'll be able to watch it from the Earth for at least another week." The SDO spacecraft captured a video of the huge X1.4 solar flare and is one of several spacecraft keeping a constant watch on the sun's weather cycle. Because the solar flare erupted toward Earth, it sent a wave of charged particles toward our planet that could slightly amp up northern lights displays. It caused a strong radio blackout for some high-frequency communications systems, according to SWPC officials. NASA and SWPC officials said the flare did trigger a huge eruption of solar plasma, known as a coronal mass ejection or CME, which is expected to reach Earth at 1 a.m. EDT (0500 GMT) on Saturday (July 14).Young said that an early analysis suggests the coronal mass ejection sent a wave of plasma toward Earth at a speed of 3.1 million mph (5 million kph or about 1,400 km per second). While it may spark a minor geomagnetic storm, power planets, satellites and astronauts need not worry, he added. "At this point, I think the impact is going to be relatively minor," Young said. X-class solar flares are the strongest type of storms that occur on the sun. When aimed at Earth, the most powerful X-class flares can endanger satellites and astronauts in space, interfere with navigation and communications signals, and damage power system infrastructure on our planet. Today's solar flare marks the sixth X-class solar flare of the year. While it is the strongest yet of the summer season, which began in late June, it is not the most powerful sun storm of 2012. That title is currently held by a March event that unleashed an intense X5.4-class solar flare. The sun is currently in the midst of an active phase of its 11-year solar weather cycle. The current cycle is called Solar Cycle 24. Editor's note: If you snap a photo of sunspot AR1520 or any amazing northern lights photos this week and you'd like to share them for a possible story or image gallery, please send images and comments to managing editor Tariq Malik at tmalik@space.com.